E. coli bacteria are the most commonly used bacteria in microbiology and biotechnology. Ultrasonic cell disruptors deliver reliable and reproducible results for the lysis of E. coli. Intense yet precisely controllable cavitation and shear forces result in complete disruption and high extraction yields (e.g. proteins, DNA). 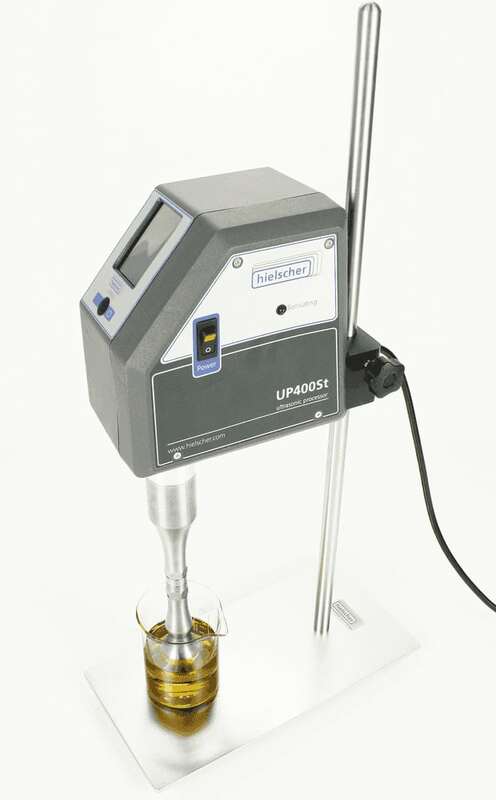 Ultrasonic probe-type homogenizers operate with approx. 20,000 cycles per second (at 20kHz) and cause cavitation in liquids or supsensions. Acoustic cavitation microscopic areas of vacuum-like pressures and high temperatures that tear cells apart. Although temperatures may reach several thousand degrees Celsius, cavitation volumes are so small they do not heat the process significantly. 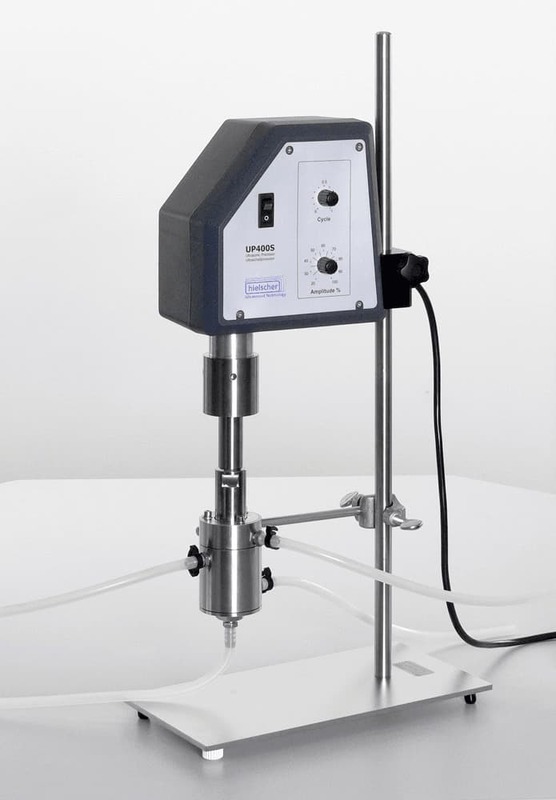 The ultrasound generated acoustic cavitation and shear forces perforate or break the cell membrane of E.coli – depending on the device setting of the ultrasonic homogenizer. 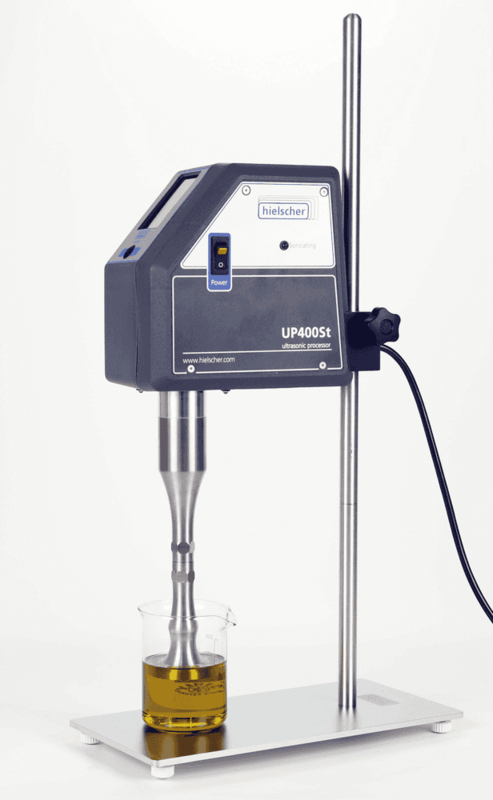 Whilst chemical and enzymtic lysis can be problematic – since chemical lysis can alter protein structures and introduce purification problems and enzymatic lysis requires long incubation times and is not reproducible – ultrasonic disruption is a sophisticated, fast cell disruption method. Ultrasonic lysis is based on mechanical forces only. No chemicals are added, sonication breaks the cell wall by shear forces. Chemical lysis can alter protein structure and introduce purification problems. enzymatic disruption requires long incubation times and is not reproducible. 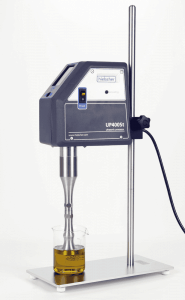 Sonication is the most popular technique for lysing very small, medium and large quantities of cell suspensions – from pico-liters up to 100L/hr (using an ultrasonic flow cell). Cells are lysed by liquid shear and cavitation. 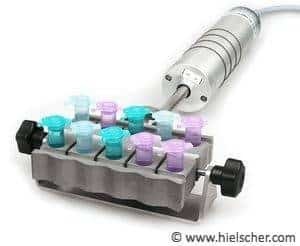 DNA is also sheared during sonication, so it is not necessary to add DNase to the cell suspension. By pre-cooling the sample and keeping the sample during sonication on ice, sample thermal degradation of the sample can be easily prevented. Ideally, samples should be kept ice-cold during lysis, but for most samples it sufficient if the temperature does not rise above the temperature of culture or tissue source. Therefore it is recommended, to keep the suspension on ice and to sonicate with several short ultrasonics pulses of 5-10 sec and pauses of 10-30 sec. During the pauses, the heat can dissipate in order to re-establish a low temperature. For larger cell samples, various flow cell reactors with cooling jackets are available. Overproduction and purification of enzymes. For overproduction of decahistidine (His10)-tagged proteins, E. coli BL21(DE3) was transformed with pET19b constructs. An overnight preculture was harvested by centrifugation, and 1% was used to inoculate an expression culture. Cells carrying pET19mgtB were grown at 22°C until an optical density at 600 nm (OD600) of 0.7. The culture was transferred to 17°C and induced by 100 μM IPTG. After 16 h, the culture was harvested by centrifugation at 7,500 × g at 4°C. Cells were resuspended in 50 mM phosphate-buffered saline (PBS) with 0.3 M NaCl at pH 7.4 and disrupted by ultrasonication with an S2 micro-tip sonotrode at the UP200St ultrasonicator (Hielscher, Teltow, Germany) at a cycle of 0.5 and an amplitude of 75%. The overproduction of decahistidine-tagged GtfC was induced at 37°C at an OD600 of 0.6 with 100 μM IPTG. Cells were then incubated for 4 h, harvested, and lysed as stated above for MgtB. A bait protein of interest (in this case, MTV1 of Arabidopsis thaliana) is fused to a GST tag and expressed in BL21 Escherichia coli (E. coli) cells. 1. Take one pellet of GST-MTV1 and GST (corresponding to 50 ml bacterial culture) and resuspend each in 2.5 mL ice cold extraction buffer. 2. 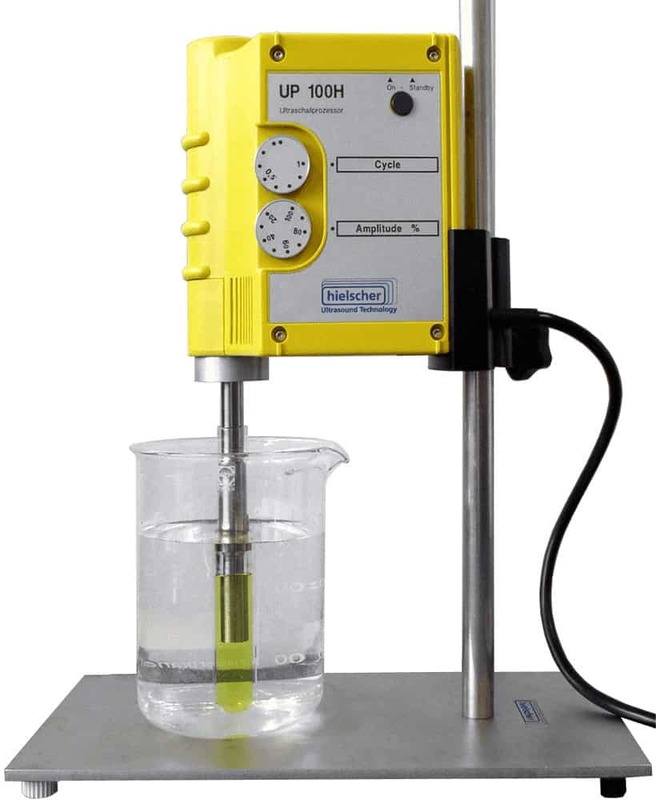 Use an ultrasonicator UP100H (equipped with MS3 microtip-sonotrode for small volumes (2-5mL)) to disrupt the bacterial cells until they are lysed, which is indicated by reduced opacity and increased viscosity. This has to be carried out on ice, and it is recommended to sonicate in intervals (e.g. 10 sec sonicating followed by 10 sec on ice and so on). Care has to be taken not to sonicate with too high intensity. If foaming or the formation of a white precipitate is detected, the intensity needs to be lowered. 3. Transfer the lysed bacteria solution to 1.5 mL microcentrifuge tubes and centrifuge at 4°C, 16,000 x g for 20 min. The single colony of E. coli BL21 (DE3) harboring the expression vector in 30 mL of Luria-Bertani (LB) medium containing 100μg/mL ampicillin, and then cultivated at 37ºC until the optical density (OD600) reached 0.6. The cells were harvested by centrifugation at 4,000 × g for 10 min, and resuspended in 3L fresh LB medium containing 100μg/mL ampicillin. Azarnezhad A., Sharifi Z., Seyedabadi R., Hosseini A., Johari B., Sobhani Fard M. (2016): Cloning and Expression of Soluble Recombinant HIV-1 CRF35 Protease-HP Thioredoxin Fusion Protein. Avicenna J Med Biotechnol. 8(4), 2016. 175–181. Jiang X., Wang J., Chang H.; Zhou Y. (2016): Recombinant expression, purification and crystallographic studies of the mature form of human mitochondrial aspartate aminotransferase. BioScience Trends 2016. Müller A., Eller J., Albrecht F., Prochnow P., Kuhlmann K., Bandow J.E., Slusarenko A.J., Leichert L.I.O. (2016): Allicin Induces Thiol Stress in Bacteria through S-Allylmercapto Modification of Protein Cysteines. Journal of Biological Chemistry Vol. 291, No. 22, 2016. 11477–11490. Rabausch U., Juergensen J., Ilmberger N., Böhnke S., Fischer S., Schubach B., Schulte M., Streit W. R. (2013): Functional Screening of Metagenome and Genome Libraries for Detection of Novel Flavonoid-Modifying Enzymes. Applied and Environmental Microbiology 79(15), 2013. 4551–4563. Sauer M. (2014): MTV1 Pull-down Assay in Arabidopsis. bio-protocol Vol 4, Iss 12, Jun 20, 2014. Waldminghaus T., Skarstad K. (2010): ChIP on Chip: surprising results are often artifacts. BMC Genomics 11, 2010. 414. Escherichia coli (E. coli) is a gram-negative, facultatively anaerobic, rod-shaped, coliform bacterium of the genus Escherichia that is commonly found in the lower intestine of warm-blooded organisms (endotherms). There are a large number of E. coli strains (or subtypes) with diverse characteristics. Most E. coli strains are harmless to humans, e.g. B and K-12 strains which are used commonly for research applications in laboratories. However, some strains are harmful and can cause serious illness. 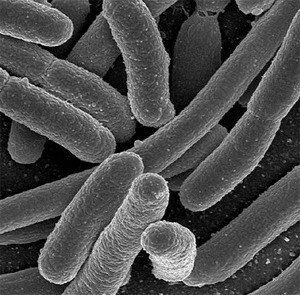 E. coli plays an important role in modern biological engineering and industrial microbiology since the bacteria is easy to manipulate. Common lab applications which involve often the use of E. coli, e.g. to create recombinant deoxyribonucleic acid (DNA) or to act as a model organism. E. coli is a very versatile host for the production of heterologous proteins, and manifold protein expression systems are available to produce of recombinant proteins in E. coli. Using plasmids which permit high level expression of protein, genes can be introduced into the bacteria, which enables to produce such proteins in high quantities in industrial fermentation processes. E.coli are used as a cell factories to produce insulin. Further applications include the use of modified E. coli cells to develop and produce vaccines and immobilised enzymes, to produce biofuels, as well as for bioremediation. The strain K-12 is a mutant form of E. coli that over-expresses the enzyme Alkaline Phosphatase (ALP). This mutation occurs due to a defect in the gene that constantly codes for the enzyme. If a gene produces a product without any inhibition this is known as constitutive activity. This specific mutant form is used for isolation and purification the ALP enzyme. Ultrasonic shear forces are a commonly used method to separate from the cell and break DNA strands into pieces. Acoustic cavitation breaks the cell walls and membranes to extract DNA from cells and generate fragments of about 600 – 800 bp in length, which is ideal for analysis. 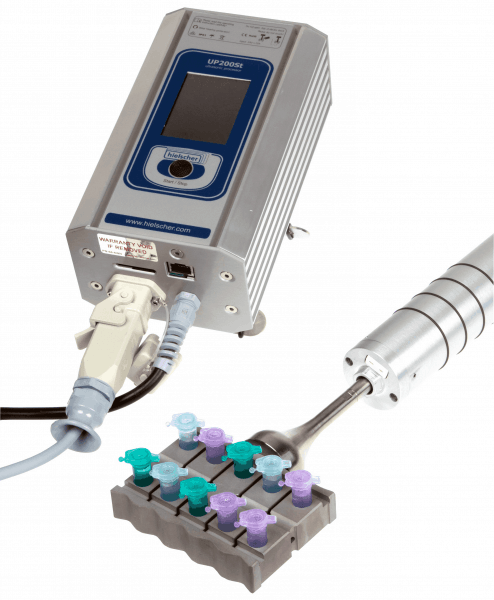 Click here to learn more about ultrasonic homogenizers for DNA fragmentation!